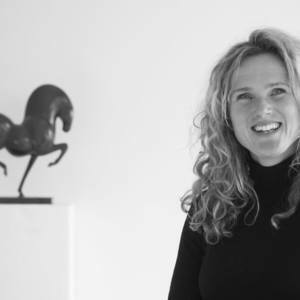 In her art, Ninon van der Sande wants to celebrate the beauty of animals and nature. She is fascinated by the way all living beings are connected, and emphasizes their similarities, rather than their differences. Ninon seeks connection with an energy of all times and all places. Her work seems to be both ancient and modern; or timeless and from everywhere. It expresses balance, essence, inner force, sensuality, life, love. Ninon travelled through the jungle, desert and mountains and speaks 6 languages. After studying at the Academy of Art, she graduated as Master of Science in Cultural Journalism at the University of Amsterdam. Ninon worked as a photo producer and also as a stylist for photo shoots and luxury design interiors. Ninon and vandersandestudio were responsible for the entire styling of the 5-star Conservatorium Hotel in Amsterdam, including restaurants, lobby, rooms, spa, corridors etc. Two sculptures of Ninon were also commissioned by the hotel. Recently, she created an outdoor sculpture for The Royal Senchi Hotel in Ghana, Africa. Also, a sculpture was acquisited for a private garden in Beverly Hills, USA. Ninon likes horse riding, sailing, skiing, dancing. She plays percussion and is singing in different Salsa Bands. She also feels a connection with the wisdom of psychology and philosophy in Tibetan Buddhism, she teaches mindfulness and Tibetan yoga. Sculpture for private garden in Beverly Hills, USA. Smelik & Stokking Galleries, Amsterdam, Holland. P Art Gallery, ‘Erase una vez’, Ibiza, Spain. Big sculpture for The Royal Senchi Hotel, Ghana, Africa. Styling Taiko, Conservatorium Hotel Amsterdam, Holland. Styling of the Conservatorium Hotel Amsterdam, Holland. Two sculptures for Conservatorium Hotel Amsterdam. L'illa d' Art, Contemporary Art Exhibition, Barcelona, Spain. Saatchi & Saatchi, online competition favorite, England. Patrick Heide Art Projects, London, England. Commission for a fountain for private garden, Holland. Rocío Tassara & Asociados, Barcelona, Spain. Kasteel de Wittenburg, Benefit Auction, Holland. Vinçon, Hypermercart de L´Art, Barcelona, Spain. Ibiza Television, IB3, Full Moon Art Fair, Spain, 2015. At5 Television, arriving of Hippo at Conservatorium Hotel, November 12, 2012, Holland. Bloomberg Television, Patrick Heide Contemporary Art, London, England, 2002. L’Echo,de France, Une Musée Imaginaire, Nov. 7, 2014, France. Het Algemeen Dagblad, Ferrari Rood Nijlpaard, November 13, 2012, Holland. Book Smelik & Stokking Gallery, 40 jaar, Holland, 2009. Book L’Illa d’ Art, Contemporary Art Exhibition, Barcelona, Spain, 2006.